RUSK, TX (KTRE) - "We aren't here because Cam'ron died, we're here because he lived," were the opening words of Cam'ron Matthew's funeral service. More than a thousand people filled the stands of the Rusk High School gym to remember Cam'ron's short but impactful life. "All the people here, not all of them were from Alto, but surrounding communities," said Alto High School Head Football Coach Paul Gould. "It's just been like that all week. Not everyone had a great chance to know Cam'ron, but everyone does somehow know about him and it's just awesome. It's an awesome thing to see." Those in attendance who didn't know Cam'ron, learned plenty about him as preachers, pastors, coaches and several others shared stories and memories of him. 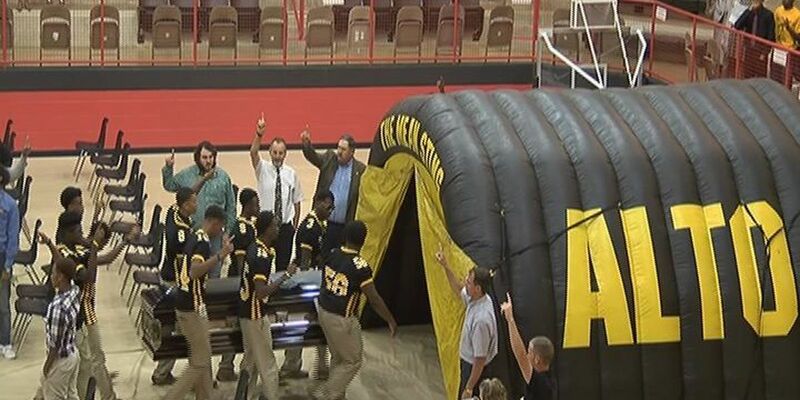 Some were funny, while others were deeply emotional, and brought tears to Cam'ron's grieving family, and his family on the field, the Alto football team. "I told the guys it's going to be tough," said Gould. "There's no manual that you can read that can prepare you for this." Through their sorrow, the team was strong and helped carry Cam'ron through the tunnel they run out of on Friday nights in the fall, one last time. "I think for them, the rest of their lives, they're going to think about this," Gould said. "What brought all those guys together was football and those guys have gone through that tunnel a lot together and they got to go through again as one team." For the community of Alto, it's going to be hard to recover from the loss of such an important person, but together, they'll pull through, because they said Cam'ron would want them to. "Cam'ron, if there was an obstacle or challenge in front of him, he was going to run right through it," Gould said. "I hope that gives comfort to a lot of people that they'll say you know what, I'm good I can get through this and I've got to get back out there." ETMC Tyler sent yellow ribbons to the funeral for everyone to wear to honor Cam'ron's organ donation that helped save six lives, including his grandfather's.